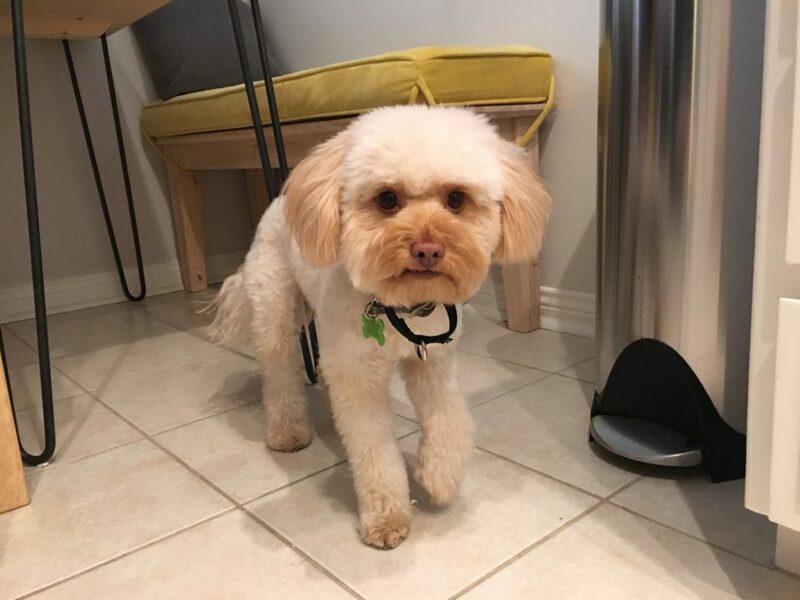 Sunny is a one-year-old mini Goldendoodle who lives in Brentwood, California. Her guardians set up a dog obedience session with me to stop a few bad habits: stop barking, anxiety, pulling on the leash, not coming when called and her fear of new people. I could tell right away that Sunny was a little bit insecure by how she interacted with me. She would bark with her head low or her body hunched over and she backed up after barking. She did respond favorably to the high-value treats that I was offering, but based on how she continually backed away, I could tell that she was not comfortable with my presence. When I sat down with Sunny and her guardians to discuss the situation, Sunny started barking at me and a territorial way. She was trying to make it clear that she disagreed with my presence and did not want me moving around without her permission. After a couple of minutes it became clear that Sunny was not going to change her behavior so I pulled out a leash and demonstrated a technique that is referred to as flooding. By blocking Sunny’s ability to run away from me, I was able to curtail her barking. You should also notice that I did not attempt to pet, talk to her or try to otherwise prove to her that I was a good person. My sole goal was to help her understand that just because she was near a human, nothing bad was going to happen. Many humans mistakenly think that we can pet a dog into trusting or liking us. But if the dog is starting out from an insecure place or does not agree with your presence, no amount of petting is going to help. I explained to the guardians that usually when a dog is acting the way that Sunny was, it’s because she considers herself to be in a position of authority. This gives the dog the impression that they need to either be responsible for the humans or in charge of security. This false perception can easily cause a dog to get stressed out. This often happens for dogs that do not have a lot of rules and structure in their lives. When that is the case, the dogs consider themselves to be your peers. But if the dog thinks it is your peer, then it has the same authority as you. When that is the case, the dog believes that listening to the humans is optional. Adjusting how a dog perceives its authority in conjunction to the humans is one of the more important thing a dog behaviorist or best dog trainer can do when working with some dogs. I suggested some rules for the guardians to incorporate as well as how to enforce them. Incorporating rules and structure can go a long ways towards helping a dog start to see the humans as being the authority figures. Once the dog sees the humans as the authority figure, then they are more content to follow the human’s lead and listen when they are commanded or corrected. One of the activities that Sunny was not very well behaved on was the walk. I learned that Sunny’s guardians were allowing her to walk in front of them which can often cause a dog to be more assertive or territorial. Because she had a tendency to pull, I fitted her up with a Martingale collar and showed her guardians how to apply the special twist of the leash to give them more control. Next I shared the three rules that I use for a structured walk; stay in your position, no stopping and sniffing and no marking. I also went over how to correct the dog when she got out of position or started to do something that the humans did not approve of. After going over the rules and leash training, we headed out for a walk. Sunny protested a little bit at first as the Martingale collar was not allowing her to control the walk as she was used to. But after a couple of minutes, Sunny realized that the collar wasn’t going away and she fell into a nice trot in the heel position next to her guardians. Midway through the walk, Sunny’s guardians lamented that there weren’t any other dogs around. Sunny’s strongest reactions seem to occur when other dogs were around; barking, lunging and snarling at any dogs that approached or were in her immediate area. Fortunately we spotted a neighbor out for a walk with their small dog. I ran ahead of Sunny and her guardians to ask the neighbor if she would be willing to allow us to bring Sunny over so that I could show the guardians how to facilitate a good interaction. Sunny’s guardians were surprised that she was not reacting to this other dog. There were multiple reasons for this; first of all we took our time leaving the home. Many people put their dog on a leash and head out while the dog is over excited or anxious. As a general rule of thumb, the energy your dog has before you leave your house is the same energy they are going to carry with them on their walk. The Martingale collar and the rules for the structured walk it also helped Sunny identify as being in the follower position. Combined with a few practice-passes by this neighbor dog before we let them interact sealed the deal. In the course of my discussion with Sunny’s guardians, it became clear to me that part of her reactivity to other dogs was due to a lack of familiarity. Just like humans who are shut-in’s, dogs that do not get to interact or socialize with other dogs can develop some social awkwardness. I recommended that the guardians look for coworker or neighbors that have dogs of similar size and energy levels. Even going to a dog park on a regular basis at the same time can help Sunny get to know a couple of dogs. Just like humans, the more we get to know someone, the more comfortable we are in their presence. When we returned it to their home, we went over a recall exercise because Sunny did not like to come when called. Many people are able to get their dogs to come to them when there is nothing else going on. We have a tendency to think that this means the dog can come to us under any circumstance or situation. But just like us, dogs need to practice things in various degrees of difficulty. While it’s easy to come over to human that calls Sunny when there’s nothing else in the room, it’s much more challenging for Sunny to ignore a barking dog, a loud motorcycle driving by, children yelling, etc. This is why it’s important to practice commands under varying degrees of difficulty and distractions. I went over how the guardians can incorporate these sort of distractions in the next video. Because Sunny’s family are expecting a new baby at the end of the year, it’s going to be important for the guardians to get Sunny his behavior under control now while I still have free time. I recommended that the guardian read an article that I published a few months ago that includes tips that a new family can use to help a dog prepare for the arrival of a baby. By the end of the session, Sunny was no longer barking when I got up to move around the room. She was starting to sit in front of her humans to request their attention rather than jumping up on them and was even walking behind them in the follower position as we moved around the apartment. The techniques and exercises we introduced in the session will go a long ways towards helping Sunny identify as a follower. Things like petting with a purpose, communicating with her in nonverbal ways and consistently enforcing the rules and structure on walks will help Sunny see and respect her guardians as authority figures.